Whereas the Association Chronicle page documents our formative years, this page illustrates some highlights of recent years. What follows are a few photos beginning in 2010, and thereafter, when we conducted our 7th Annual Tadeusz Kosciuszko Conference which included a commemoration of the 600th anniversary victory of the forces of Poland and Lithuania over those of the Knights of the Teutonic Order in the great battle of Grunwald-Tannenberg-Zalgiris. Some 385 years following that battle, Tadeusz Kosciuszko was destined to become the last defender of the Commonwealth of Poland and Lithuania against Russia, Prussia, and Austria who, by their collaborative Partition of Poland and Lithuania in 1795 eliminated the Commonwealth from the map of Europe and absorbed the defeated Poles and Lithuanians into their separate empires for the next 123 years. With the end of World War I, and largely the result of U.S. President Woodrow Wilson's "Fourteen Points" and the fortitude of generations of the former Commonwealth's patriots, Poland and Lithuania were restored as independent and separate nations. 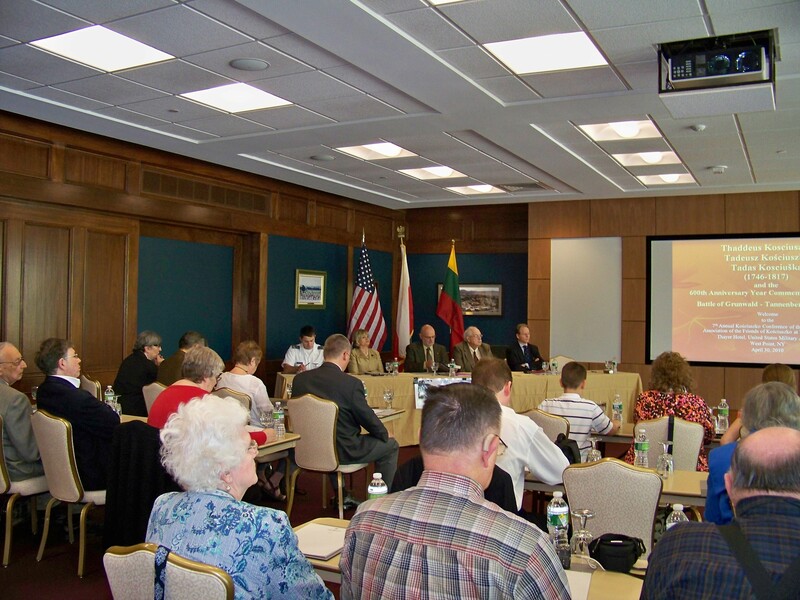 The next photo, therefore, begins with our 7th Annual Tadeusz Kosciuszko Conference that was held in the United States Military Academy's Thayer Hotel. Subsequent photos document our Association's representative activities to the present. The opening of that Conference took place in the Thayer Hotel's Eisenhower Room that overlooked the magnificent Hudson River. A view of the audience in 2010 from a different perspective. Without our loyal members (one of whom was Founding Vice President and later Executive Vice President George A. Katucki shown seated second from right forefront) as well as those who to this day admire and respect the altruistic life of Kosciuszko, the mission of our Association could not be carried out. This view focused on the panelists as well. 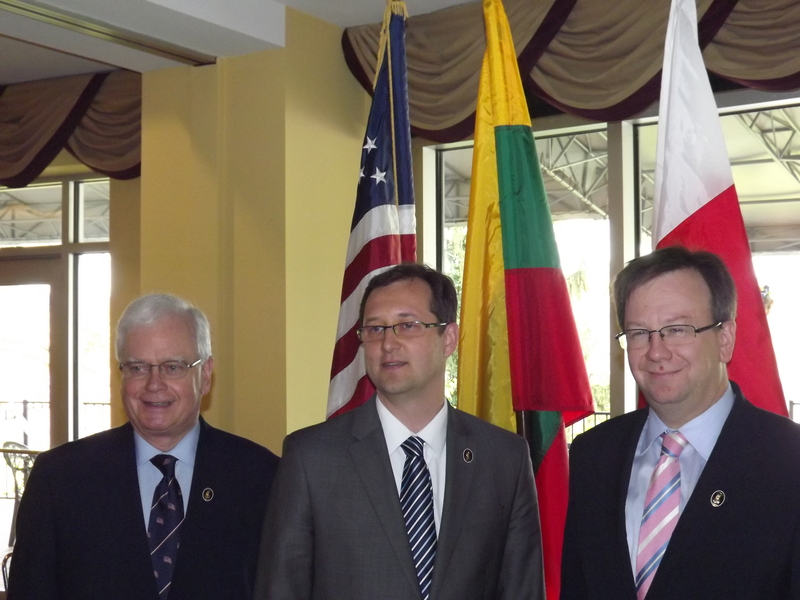 Our distinguished panelists in 2010 had been, from right to left, Wlodzimierz Sulgostowski, First Counselor and Head of the Consular Division, Embassy of the Republic of Poland, Washington, DC; James S. Pula, Ph.D., Professor of History and Kosciuszko Biographer, Purdue University, Indiana; Saulias Suziedelis, Ph.D., Professor of History, Millersville University, Pennsylvania; Betsey Blakeslee, Ph.D., former Professor of Mass Communications, Piedmont College, Georgia; and Artur Dominiak, Cadet, United States Military Academy and member of the Kosciuszko Squadron of West Point. AAFKWP President, Associate Dean (ret.) and Senior Lecturer in History Anthony J. Bajdek of Northeastern University in Boston served as moderator and presenter. 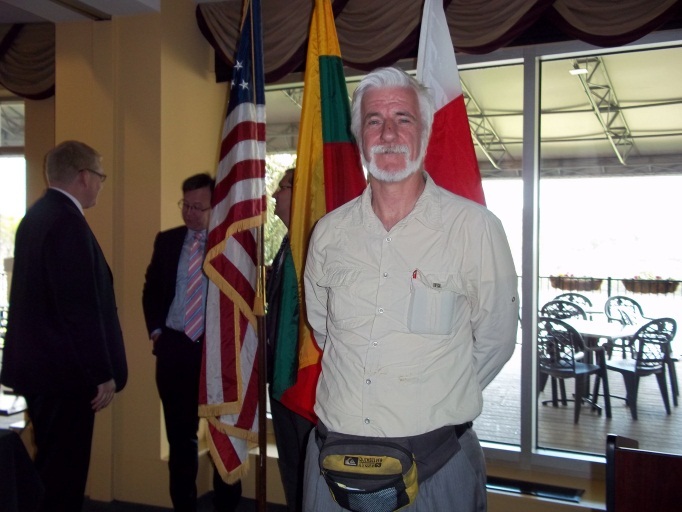 The following day, Ambassador Audrius Bruzga of Lithuania's Embassy in Washington, DC served as the keynote speaker for the Annual Kosciuszko Monument ceremony at the Academy. However, because of the tragic circumstances took the lives of the top leadership of Poland's government in the air over Smolensk, Russia that occurred shortly prior to our 7th Annual Tadeusz Kosciuszko Conference, Poland's Ambassador to the United States, Robert Kupiecki, was unable to participate in the Association's two-day venue at West Point that year. Therefore, First Counselor and Head of the Consular Division, Wlodzimierz Sulgostowski, represented the Ambassador and Embassy. We have been and continue to be gratified that the Pubic Affairs Office at West Point has publicly recognized and graciuosly facilitated our annual program honoring Kosciuszko. 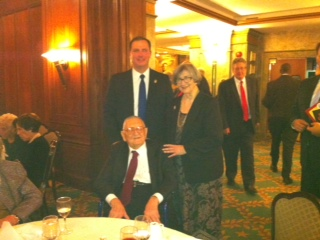 Ambassador Victor H. Ashe II and Association President Anthony J. Bajdek. Over the years, our Association has engaged a variety of distinguished keynote speakers and panelists both for its Annual Kosciuszko Conferences and for its affiliated Annual Kosciuszko Monument commemorations, including among others, the Honorable Victor H. Ashe II, of Knoxville, Tennessee who had served as United States Ambassador to Poland from 2004 to 2009, and also had served as our Association's keynote speaker for the 2011 Kosciuszko Monument commemoration. In 2011, our 8th Annual Tadeusz Conference took place in the United States Military Academy's West Point Club. Shown seated from left to right are panelists Anthony A. Kajencki II who presented on the topic, "Col. Thaddeus Kosciuszko Travels South to Traveler's Rest and Beyond;" Carol Lasata Gargan, Ph.D., who presented on the topic, "The Kosciuska Healing Garden Project in Scranton, Pennsylvania;" James S. Pula, Ph.D., Professor of History, Purdue University, who presented on the topic, " Thaddeus Kosciuszko: Hero of the Northern Campaign;" and Michael Alfred Peszke, M.D., Professor Emeritus, University of Connecticut School of Medicine, who presented on the topic, "The Kosciuszko Squadron 303 of World War II." 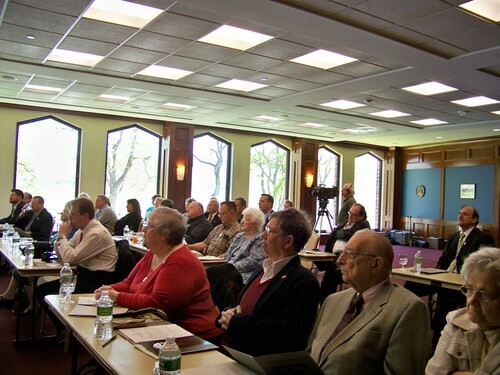 The final panelist had been Betsey Blakeslee, Ph.D., former Professor of Mass Communications, Piedmont College, who presented on the topic, "Reclaiming Kosciuszko's Garden and Flirtation Walk at West Point," unfortunately had not been available when this photo was taken. 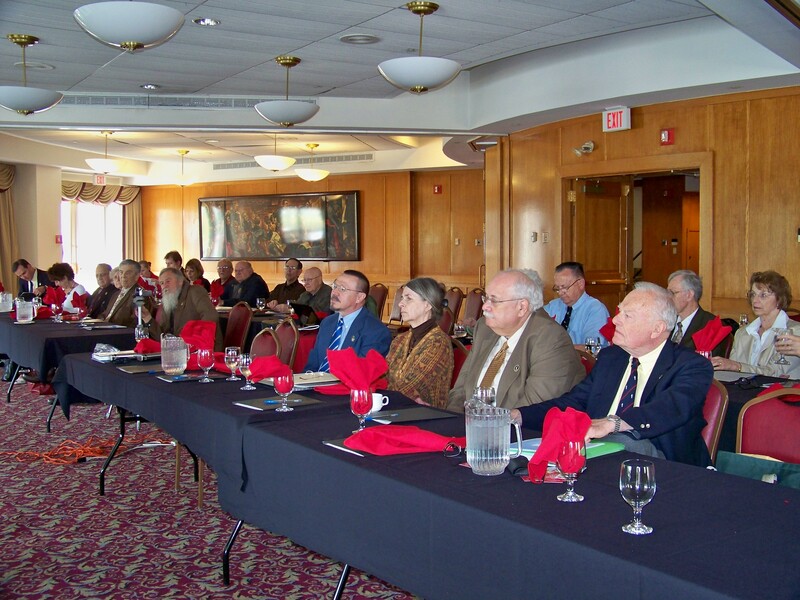 In 2012, our 9th Annual Tadeusz Kosciuszko Conference was also held in the West Point Club, and with it, a new format had been introduced. It not only included a new discussion on the life an times of Kosciuszko as the greatest final defender of the Polish-Lithuanian Commonwealth prior to its final Partition by Russia, Prussia, and Austria in 1795, but also included an equivalent in-depth examination of present-day security issues facing both Poland and Lithuania, equal members of the European Union and allies of the United States. Among the panelists participating in the morning segment of the Conference, pictured here from left to right with its moderator and presenter, Dean Anthony J. Bajdek, were Simonas Satunas, Deputy Chief of Mission of the Embassy of Lithuania, Washington, DC, and Maciej Pisarski, Deputy Chief of Mission of the Embassy of Poland, Washington, DC. The afternoon segment of our Conference in 2012 included from left to right, Lieutenant Colonel (U.S. Army, retired) and our Association's Executive Vice President Stephen N. Olejasz as its moderator and presenter, Colonel (U.S. Army, retired) Michael Miggins, and Peter Doran, Senior Policy Analyst of the Center for European Policy Analysis, Washington, DC. During his Army career, Lieutenant Colonel Olejasz had traveled to Vilnius, Lithuania in his capacity as Chief of Coalition Affairs Policy of the Pentagon's Joint Staff. Colonel Miggins served as a member of the Senior Staff for Political Affairs and Security Policy, NATO International Staff, of NATO Headquarters in Brussels, Belgium. CEPA's Doran is a member of the only Washington, DC based "think tank" which is focused on Central and Eastern Europe. A 2012 conferee of Polish descent from distant "Down Under." Felix Molski of Sefton, New South Wales, Australia is a Polonian acticvist, author, world traveler, and a genuine "Friend" of Kosciuszko from the Southern Hemisphere. To learn about the scope of activities of Polish Australians, click on our Expanded Links Page, and open "Kosciuszko Heritage." 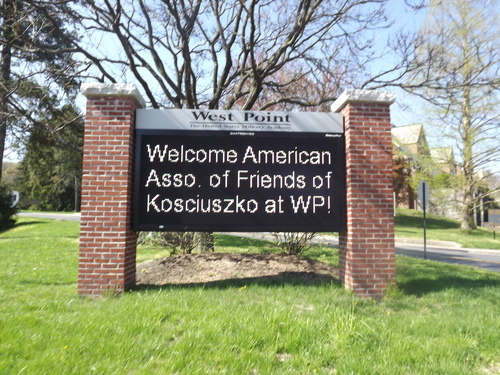 Our Association's Annual Tadeusz Kosciuszko Conference was established to complement the Annual Tadeusz Kosciuszko Observance at West Point, the first of which occurred on July 4, 1828 when the Academy laid the corner-stone of what would become the Kosciuszko Monument, being the design of John H. B. Latrobe (1803-1891), who at one time had been a member of the Corps of Cadets. 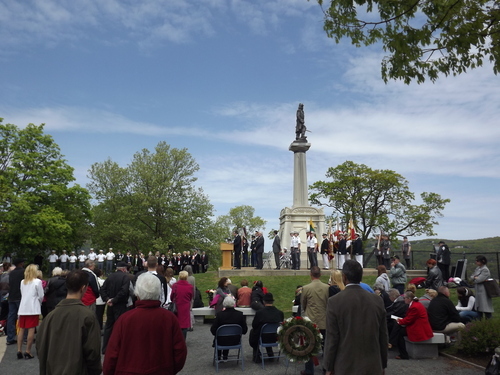 The Kosciuszko Monument observance is held annually in early spring, either in late April or early May in accordance with the United States Military Academy's annual calendar of events. By tradition, it is never cancelled because of inclement weather conditions. Fortunately, weather conditions are near-always dry, sunny, and mostly warm, and from a visual perspective, picture perfect. On the infrequent occasions of inclement weather, however, the ceremonies are shortened of necessity. Occasionally, an unexpected guest participates in the Association's Annual Kosciuszko Monument observance, one of whom as noted above had traveled from Australia, and including another who came from France. The Cadet shown here on the far right was an exchange student at West Point from the Military Academy of France (Ecole Speciale Militaire de Saint Cyr). As such, he was dressed in the uniform of the French Army and carried a ceremonial sword. Included in the Corps of Cadets at West Point are many foreign exchange Cadets from nations with whom the United States is allied. 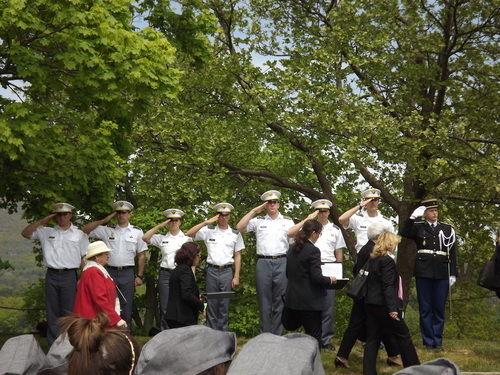 The last exchange Cadet from Poland graduated from West Point in 2013. Currently, there are several exchange students from Lithuania who are working toward graduation as well. The symbolism of having exchange Cadets from Poland, Lithuania, and France -- the European nations, in addition to the United States, with which Kosciuszko had been intimately involved during his heroic and altruistic lifetime -- is particularly noteworthy and highly appropriate. The Annual Tadeusz Kosciuszko Memorial Mass is an integral aspect of the Association's two-day venue at West Point. 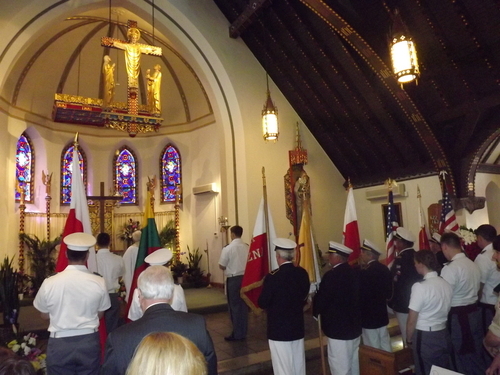 Typically participating in the Mass are members of our American Association of the Friends of Kosciuszko at West Point, Cadet members of the Kosciuszko Squadron of West Point, members of the Sea League (Liga Morska) of America, members of the Polish Singers Alliance of America, members of the Polish American Congress, members of the Polish Scouting Organization, members of the Lithuanian Friends of Pennsylvania, members of the Pulaski Parade Committee's Elizabeth, NJ contingent, members of the Westchester, NY Pulaski Association, and other "Friends" of Kosciuszko, both civilian and military, principally originating in the northeastern United States. Our 2013 Conference focused principally on West Point and Kosciuszko during the American Revolution. 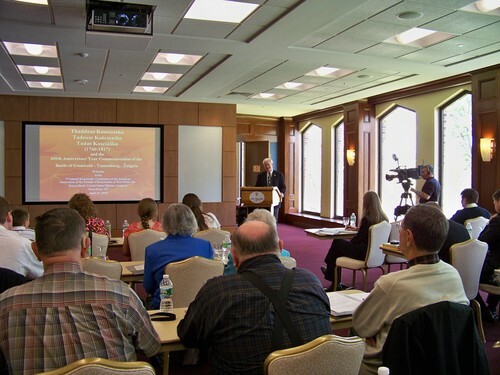 The afternoon segment of our 10th Annual Tadeusz Kosciuszko Conference focused on the history of West Point during our nation's War of Independence. 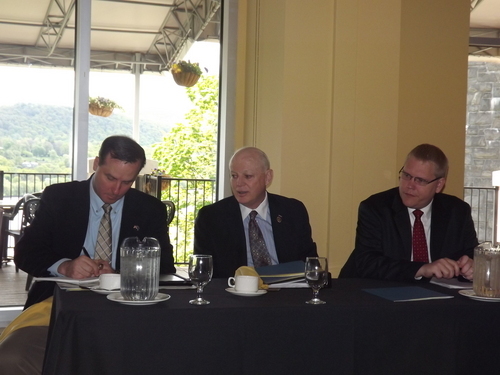 The panelists constituting it who were either graduates of the United States Military Academy or members of its staff at one point, or both for that matter, as well as non-military staff employed by the Academy -- each of whom contributed to the presentation -- were, from left to right, Lieutenant Colonel David Siry, Assistant Professor, Department of History, United States Military Academy; Colonel, U.S. Army (ret.) 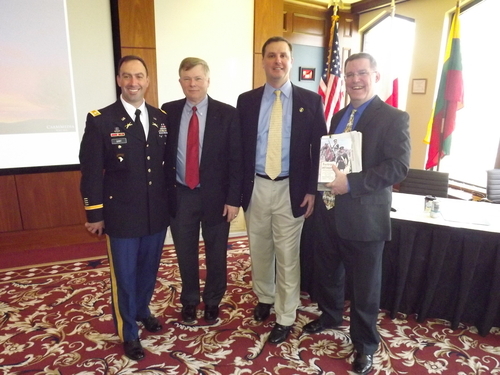 James M. Johnson, Ph.D., Professor of History and Executive Director of the Hudson River Valley Institute, Marist College, New York, and former Professor and Chief, Military History Division, Department of History, United States Military Academy; Stephen N. Olejasz, Executive Vice President, American Association of the Friends of Kosciuszko at West Point, and Lieutenant Colonel, U.S. Army (ret.) and former Assistant Professor, Department of History, United States Military Academy; and Professor Sam Watson, Department of History, United States Military Academy, West Point, New York. Recognizing the distinguised career of service to America by the venerable Lieutenant General and Ambassador Edward L. Rowny, Ph.D., an Honorary Board Member of the American Association of the Friends of Kosciuszko at West Point. 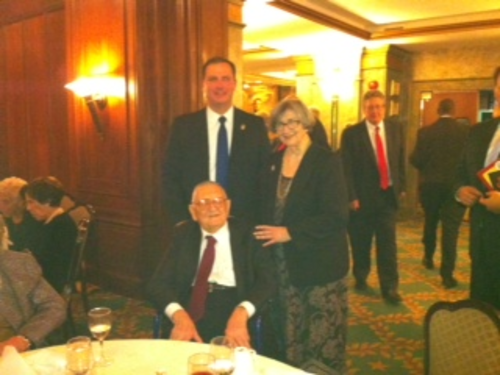 During an October 2013 testimonial dinner for General Rowny in Washington, DC, Stephen N. Olejasz and Frances X. 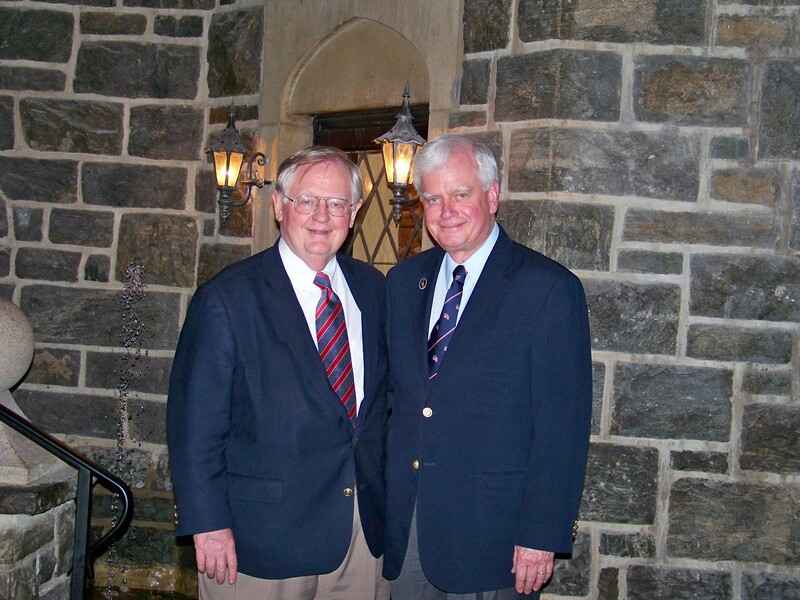 Gates, both of whom serve as Executive Vice Presidents of the American Association of the Friends of Kosciuszko at West Point, had an opportunity to congratulate him for his splendid and substantive record of service to the United States during his long distinguished career in the United States Army and as a United States Ambassador. Both General Rowny and Lieutenant Colonel Olejasz graduated from the United States Military Academy in West Point, New York.